2017 reissue on 180g LP MONO 50th anni. -1967 debut album Alice's Restaurant. 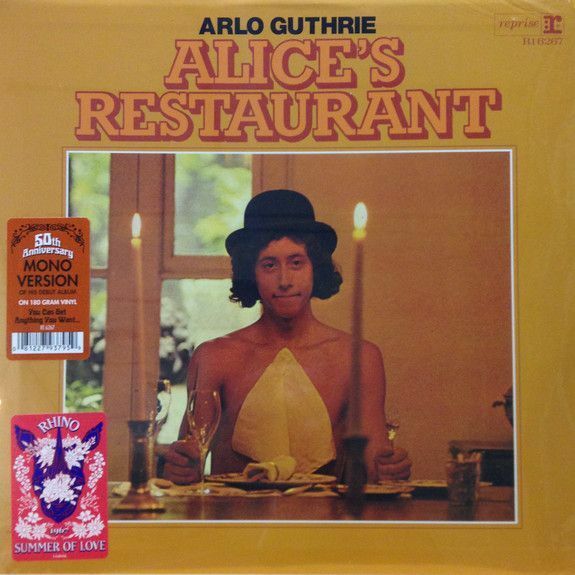 It is notable as a satirical, first-person account of 1960s counterculture, in addition to being a hit song in its own right and an inspiration for the 1969 film, also named Alice's Restaurant. 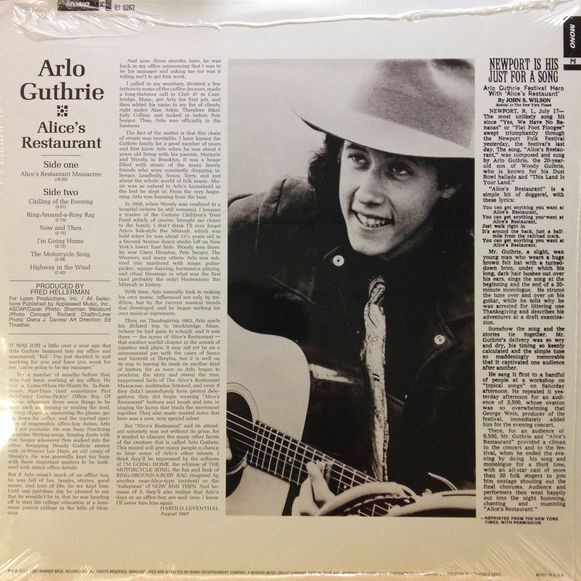 Although he'd been a fixture on the East Coast folk circuit for several years, Arlo Guthrie did not release his debut album until mid-1967. 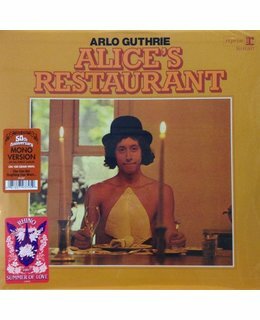 A majority of the attention directed at Alice's Restaurant focuses on the epic 18-plus-minute title track, which sprawled over the entire A-side of the long-player. However, it is the other half-dozen Guthrie compositions that provide an insight into his uniformly outstanding, yet astoundingly overlooked, early sides on Warner Bros. Although arguably not 100 percent factual, "Alice's Restaurant Massacree" -- which was recorded in front of a live audience -- is rooted in a series of real incidents. This decidedly anti-establishment saga of garbage dumps closed on Thanksgiving, good ol' Officer Obie, as well as Guthrie's experiences with the draft succeeds not only because of the unusual and outlandish situations that the hero finds himself in; it is also his underdog point of view and sardonic delivery that maximize the effect in the retelling. In terms of artistic merit, the studio side is an equally endowed effort containing six decidedly more traditional folk-rock compositions. Among the standouts are the haunting "Chilling of the Evening," which is given an arrangement perhaps more aptly suited to a Jimmy Webb/Glen Campbell collaboration. There is a somewhat dated charm in "Ring-Around-a-Rosy Rag," a sly, uptempo, and hippie-friendly bit of jug band nostalgia. "I'm Going Home" is an underrated minor-chord masterpiece that is not only reminiscent of Roger McGuinn's "Ballad of Easy Rider," but also spotlights a more sensitive and intricate nature to Guthrie's craftsmanship. Also worth mentioning is the first installment of "The Motorcycle Song" -- which was updated and discussed further on the live self-titled follow-up release Arlo (1968) -- notable for the extended discourse on the "significance of the pickle."